In trying to cast their faith as tolerant and accepting of others, many Muslims like to point to the Quran's verse 2:256: "There shall be no compulsion in [acceptance of] the religion," it begins. It's a comforting thought. While dawa, a form of proselytizing, is a key element of the faith, the argument makes it sound as if there are no repercussions for those who do not accept the faith or who reject it. But, in scripture and in practice, this simply is not true. Verse 25:11, for example, warns: "But they have disbelieved the Hour (the Day of Judgment) and for those who disbelieve the Hour, We have prepared a flaming fire." Verse 4:151 similarly, promises "the disbelievers a humiliating torment." Right now in Malaysia – often held up as an example of a moderate Muslim-majority nation – police are under instruction to "hunt down" non-believers through state-mandated re-education programs and "fix their faith" if they once were Muslims. All this because of a photograph posted online Aug. 2 which showed a group of more than three dozen smiling young people who are part of the Atheist Republic, a support and social media outlet with more than 1 million followers worldwide. Founder Armin Navabi created the group while still living in Iran, one of 13 Muslim-majority countries that punishes apostasy with death. 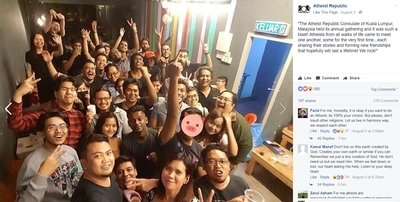 The meeting in Kuala Lumpur "was such a blast," the Facebook post said. "Atheists from all walks of life came to meet one another, some for the very first time...each sharing their stories and forming new friendships that hopefully will last a lifetime! We rock!" They did harm to no one. But cabinet minister Datuk Seri Shahidan Kassim learned of the gathering and saw a threat to Malaysia's national well-being. He called for authorities to "hunt down" those present, noting that Malaysia's constitution is silent about atheists. "This clearly shows that the group goes against the Constitution and basic rights," he said. While Malaysia is one of the countries that can carry out the death penalty for apostasy, no government official is using such terms. So far. 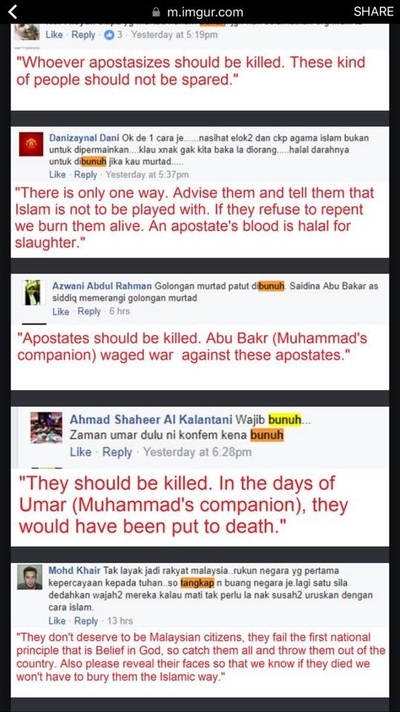 Social media, however, is filled with death threats against the Malaysian atheists. "Advise them and tell them that Islam is not to be played with," Danizaynal Dani wrote. "If they refuse to repent we burn them alive. An apostate's blood is halal for slaughter." "It is better to die from hanging for murder, than to die as an apostate," wrote Irfan Samsuri. Navabi also co-hosts a podcast with other ex-Muslims, called, "Secular Jihadists from the Middle East." In an emotionally-charged special episode on the Malaysian threats Tuesday night, he said police had already visited at least one of the people in the photograph. He was surprised by the reaction. He was less surprised by the lack of attention Western news outlets and supposed liberal activists have given the situation. "If this was happening to any other group, any other group, there would be an outcry right now," he said. "If this was a group of Muslims being treated like this, if this was a group of Christians being treated like this, the whole world would be reacting to it right now." Navabi's observation leads to the simple question: Why isn't this attack on freedom gaining more attention? None of the national Islamist activist groups, which would organize protests and marches if the targets were Muslims, have said anything. The same groups have pushed the "no compulsion in religion" argument, though, so it might be difficult to acknowledge the rights of ex-Muslims in Malaysia without grappling with some uncomfortable realities. Unfortunately, the same also can be said for a series of other cases in which Muslim-majority countries prosecute or see mob violence attack and kill people for thought crimes. One hears very little about these cases outside of the interest groups directly affected. "But I saw clearly that he was striking Raif with all his might. Raif's head was bowed. In very quick succession he took the blows all over the back of his body: he was lashed from shoulders to calves, while the men around him clapped and uttered pious phrases." In Bangladesh, a series of brutal machete attacks killed at least 11 secular and atheist bloggers since 2013. One, Avijit Roy, was an American citizen. His wife was severely injured, but survived and continues to speak out about free expression. 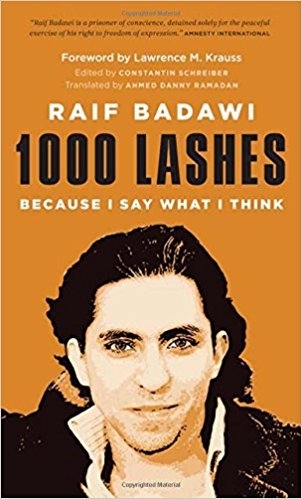 Regardless of one's views on religion, these Malaysian people's plight – like Raif Badawi's and like the slaughtered Bangladeshi writers – is about the right to free speech, free thought and peaceful assembly. These ideals are the foundation of a free society, or liberty. It would be nice if more people—of any or no religion—called out these human rights abuses.